A fair amount of the detritus that gets washed up on our beaches comes from either hobby fishing or the fishing industry. 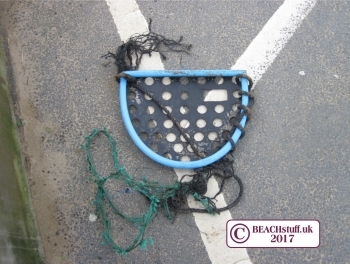 We call it ghostgear - stuff that is no longer used as fishing gear but continues to float about our seas trapping marine wildlife. 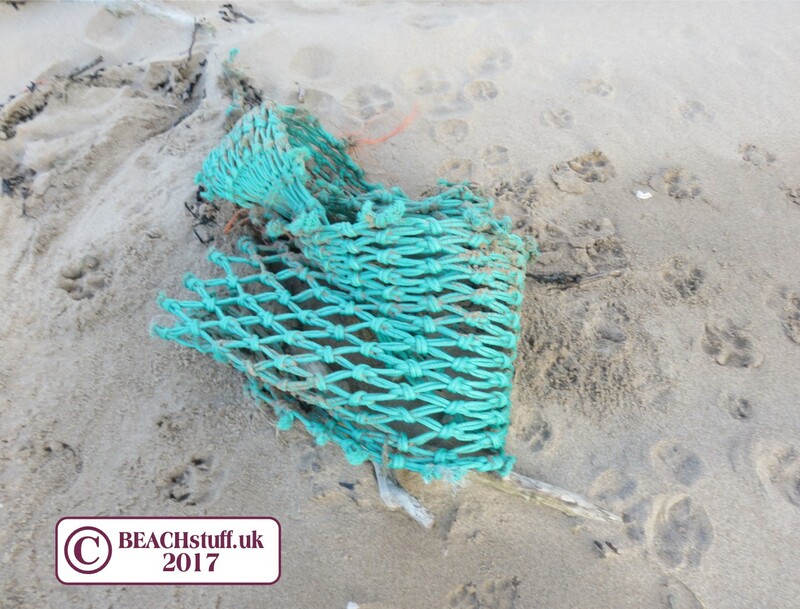 People who fish at sea do so in incredibly difficult situations and accidents will happen where things get washed overboard. Pieces of fishing net are commonly found on the strandline. 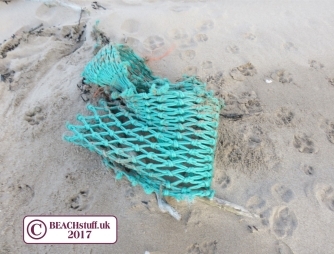 They can be small pieces, long lengths or huge panels of complete net. 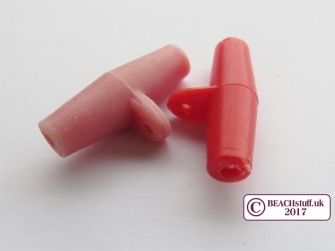 They tend to stick around as they are made of very durable plastic. 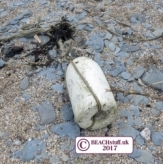 Sometimes they still carry an overpowering reek of fish. As the collection pictured below shows, they come in a wide array of colours and patterns. 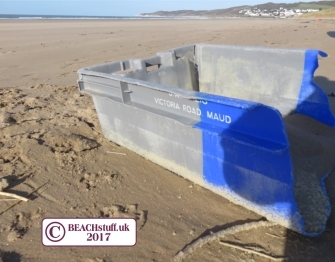 These large crates used to store fish often carry the name of the fishery on them so you can tell how far they have travelled. The blue one above right, for example, came from Kilkeel, Country Down in Northern Ireland. 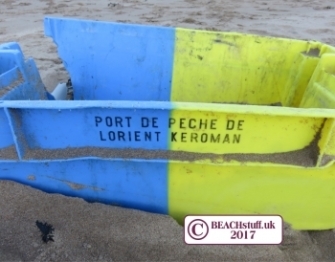 The blue and yellow crate hails from Lorient in Brittanny and the blue and grey crate from Aberdeenshire. A common practice in night fishing is to use light sticks - which give off a bright luminesence - to attract fish. 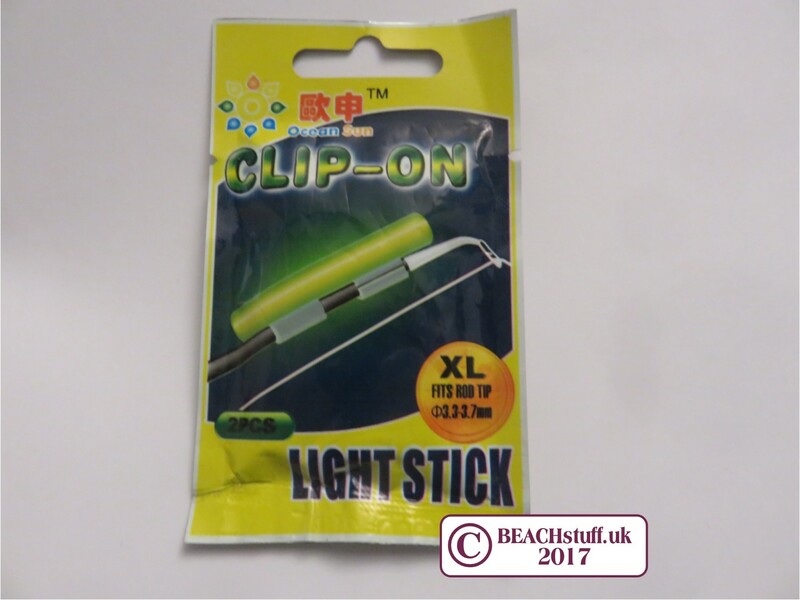 The sticks are found in a variety of sizes - the one on the left is a small version for attaching to the end of a fishing rod. 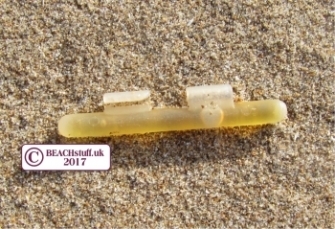 The one below is about 10cm long. 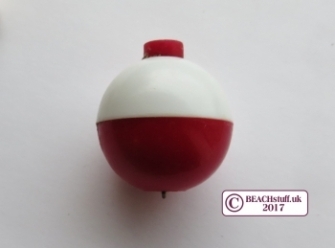 A fishing float (or bobber) is used in angling to stop the baited fishing hooks sinking to the bottom of the water. 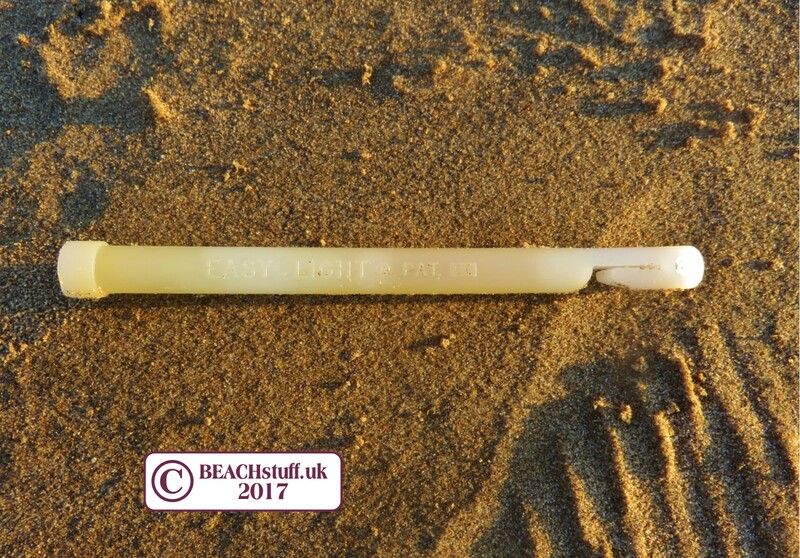 Fish that like to eat other fish can, it seems, be lured onto the hook by a plastic fish. Seems amazing that they can be fooled in this way, but fooled they can be. Try not to be fooled yourself as plastic never tastes good. 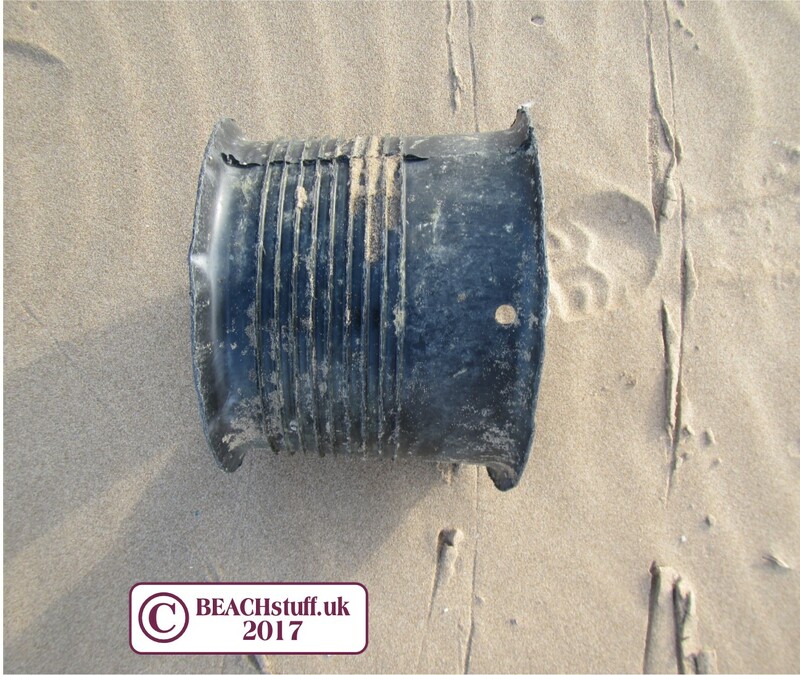 Another item of sea fishing equipment. 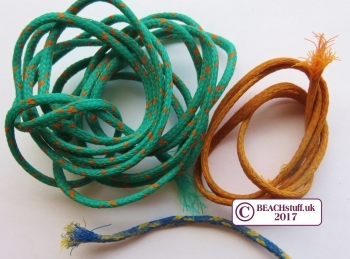 Being hollow, they hold the line and thus prevent tangling. They always seem to be red. Unless, of course, they have faded to pink. 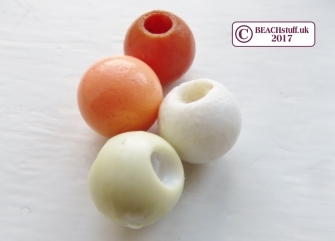 These beads are found in a range of sizes and colours. 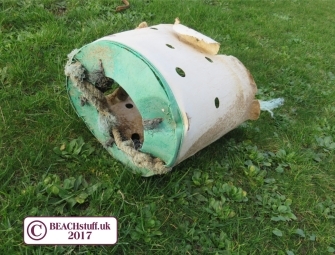 Most, it would seem, come from fishing activities. 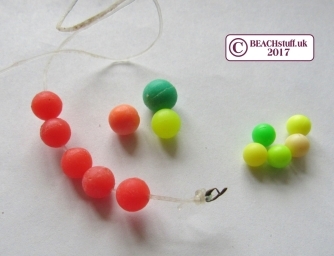 These tiny beads are threaded onto fishing line to attract fish with their brightness. Compare these with the five flourescent pellets on the right which are from toy guns. 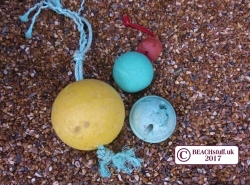 The only difference seems to be the holes in the fishing beads. Both appear on the beach pretty regularly. 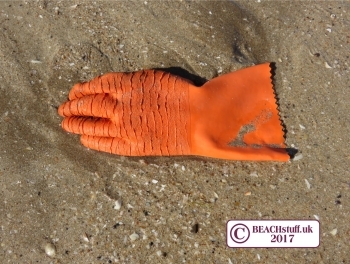 Rubber gloves like this are an essential part of fishing boat equipment. Sadly, they often seem to get lost overboard and end up on our beaches. This small plastic pot, often called a Scotty Pot, is about 15cm tall and originally has a matching lid. They always seem to be orange in my experience. 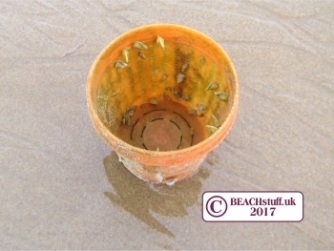 To catch a crab, they are packed full of bait like sardines, for example. The one pictured must have been at sea for a while, goose barnacles have made a home in it. 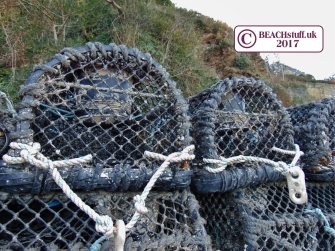 A lobster pot, or creel, is used to trap and contain lobsters until they can be removed by the fisherman. 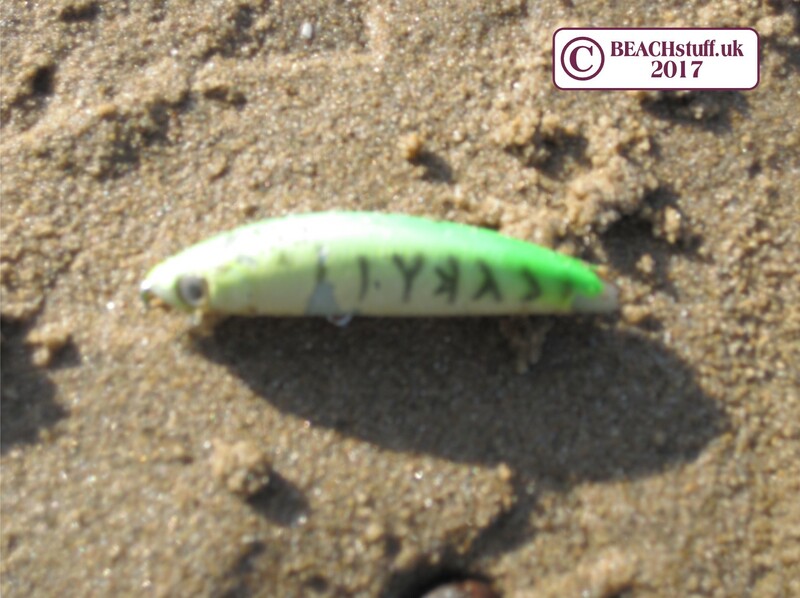 They come in all sorts of designs. Two designs in plastic are shown on the left with a black plastic lid shown below. 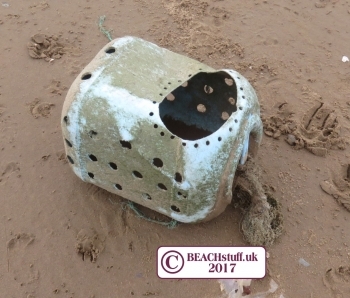 Some designs of lobster pot have a plastic tunnel through which the hapless creature crawls before becoming trapped in the pot. 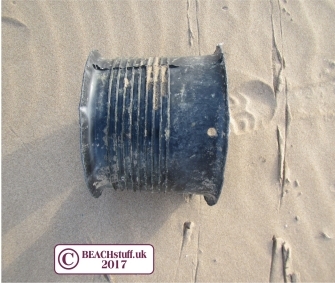 These tunnels often have horizontal grooves and are made of black plastic. 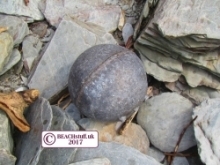 They are around 20cm in diameter. 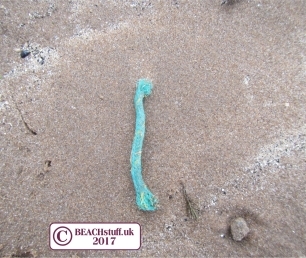 What really makes them interesting is that they can carry barnacles from their journey in the water. 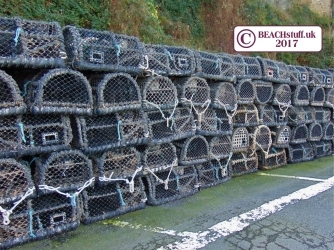 Below are whole lobster traps stored ready for use. 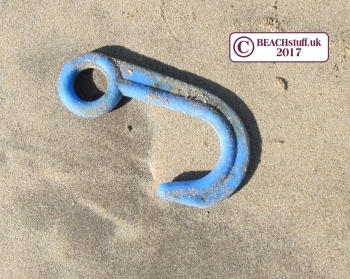 These large plastic hooks appear in a range of colours. 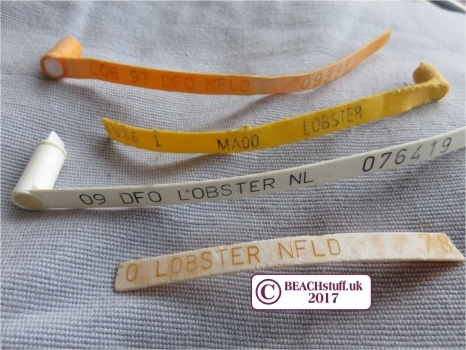 They are used to hold the lids of lobster pots closed trapping the lobster inside. 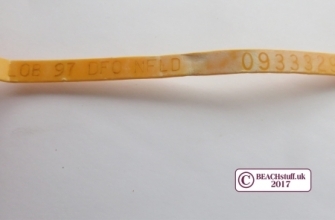 To show that a pot has the required permit, they are tagged carrying some interesting details. The tag below, for example has 'Lob' showing its function, '97' indicating the year issued, 'DFO' indicating it was issued by the Fisheries and Oceans Department of the Canadian Government and 'NFLD' which means it related to Newfoundland. 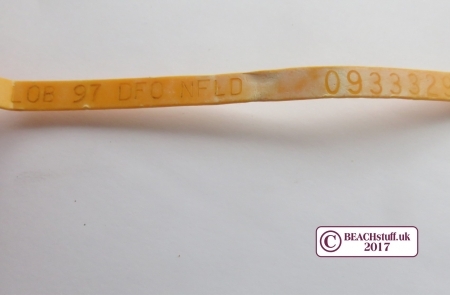 There is also a registration number. 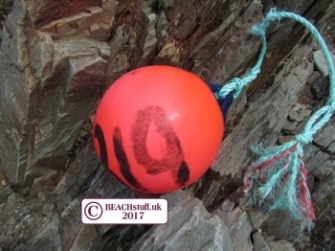 Fishing boats have many uses for buoys including marking lobster pots, and mooring places. 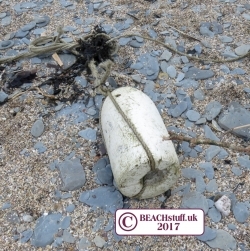 We find buoys made from a wide range of materials like those pictured here with are rubber, hard plastic, polystyrene and even an old one in metal. 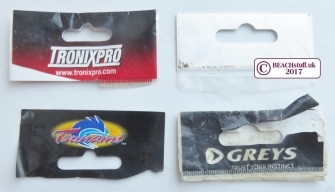 These are all the tops from bait bags or bags that contained items of fishing tackle. 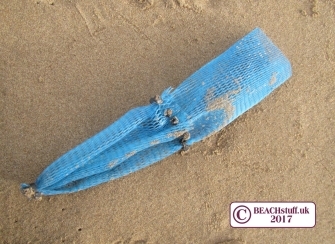 Two pieces of blue pastic mesh fixed together with black plastic clips into a long sock-like bag about 30 centimetres long. 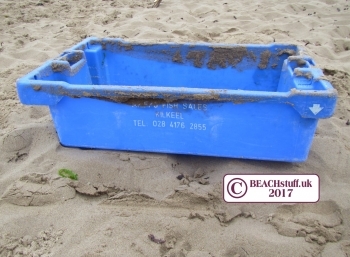 hello@beachstuff.uk and we'll feature your ideas and any photos you send. Once we've solved this one, I'll post another challenge.